All Shedworx products are now fully tested and supported under OSX 10.7 Lion. Fixed minor layout problem on the disk image installer. Here are the 10 most important things you need to know about OSX Lion. This means that you have to be on the latest version of OSX 10.6 (Snow Leopard) and have a Mac App Store account. Lion is a 3.5 Gb download so make sure you are on a good Internet connection before you kick off the install process. 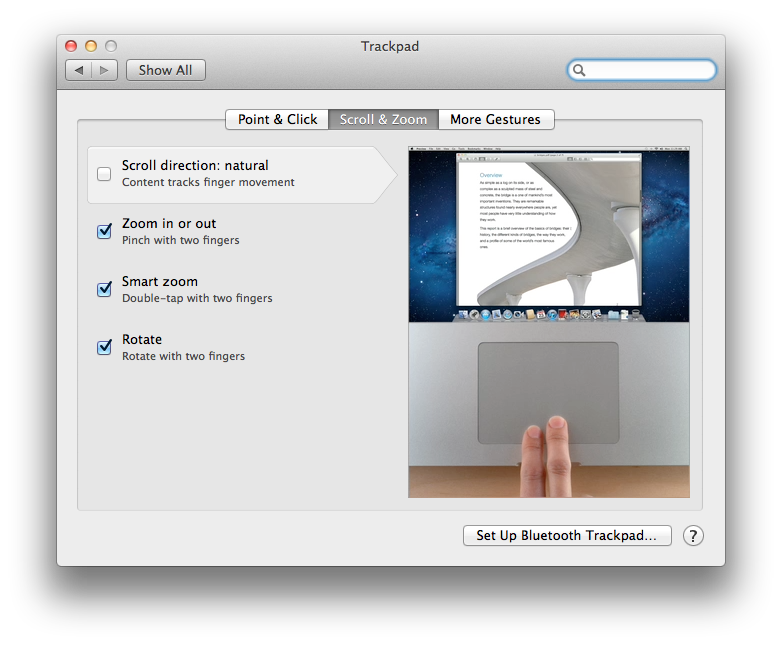 Apple have reversed the scrolling direction on the trackpad so that the page moves in the direction your fingers move. This makes the trackpad match the iPad and iPhone scrolling behavior, but it is extremely annoying. After giving it a while to see if i could get used to it, I've turned it off. The basic problem with this idea is that while touch-based scrolling works on a touch screen, it's doesn't work on a trackpad. 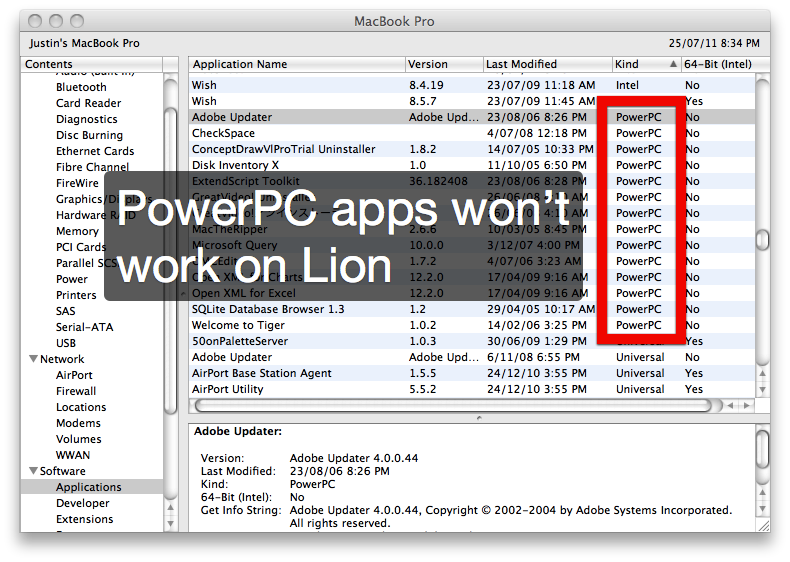 Once you move to Lion you won't be able to run PowerPC apps. This is a housekeeping change to make life easier for Apple. At some point they need to leave behind old operating system features. Then go to the Software node on the list and see all your apps listed out. Anything with PowerPC in the type field won't work when you go to Lion! See if these apps matter to you and if so, look for replacements before you upgrade. iPad users will be familiar with the lack of a 'Save' idea on most apps. If you have used Pages (or Numbers or Keynote) on the iPad you will know that you never save a document - Pages is autosaving constantly in the background so that you don't have to worry about it. This has been a fundamental part of iOS from the beginning - keep the apps simple and autosave all the time - don't make the user remember to push a button. I've found autosaving on the iPad to be a great idea. 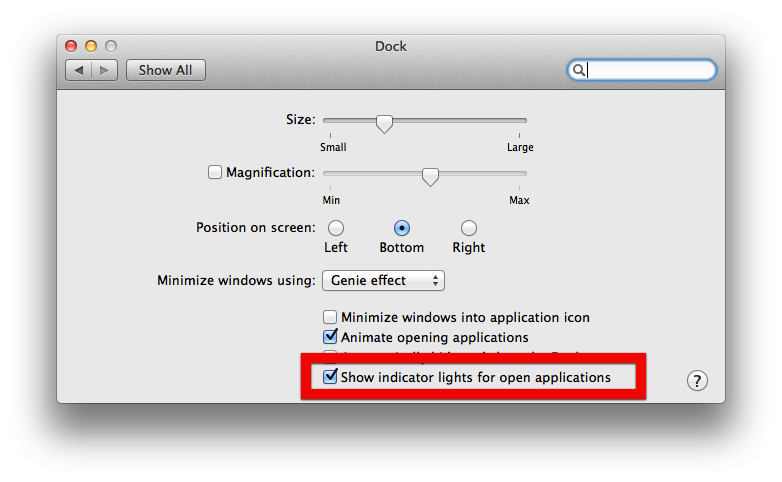 In OSX Lion, Apple brings this idea to the Desktop. Apps have to implement the new Lion document management approach to bring it to life. This isn't something that an app gets 'for free'. So far this is the iLife and key OSX apps (e.g. Preview and TextEdit) only. No Save button - what? Thats right, you no longer Save things. Just work away and close the document when you are done. Pages takes care of the rest. 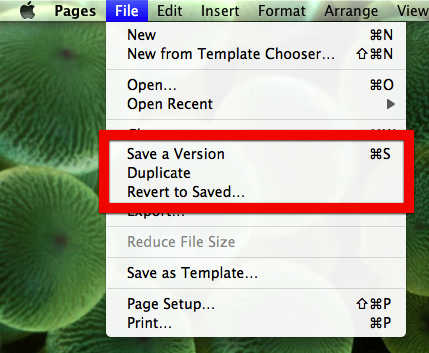 Save a Version - Pages will be saving a version whenever a 'significant' change is made, but you can also force a version save whenever you like. Note that this command uses the traditional Apple-S command, so it is very much a replacement for the old Save idea. Revert to Saved - with Pages constantly saving versions of your documents you still need to get back to the saved version sometimes. These changes mean that you can forget about document management and concentrate on what you need to get done. Document management also means that Pages (and any app that supports Lion's new document model) can restore itself to its last state on restart. 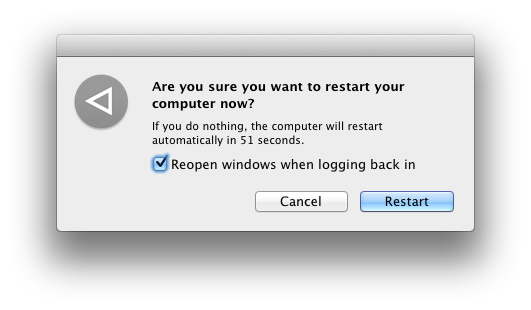 This means that you can restart your Mac and have everything come back up as you had it at logout/shutdown time. Mac users will be familiar with the Application Lifecycle that is used by most apps where the app stays running after you close the last document window. This has always been a key difference between OSX and Windows. In Lion, Apple takes this one step further where an app never really quits, even when you tell it to Quit. There is a new preference in the Dock settings that lets you switch off the indicator light for running apps in the Dock. This was actually the default behaviour in the developer releases of Lion. Apple is now telling you to completely forget about whether an app is running or not. You can leave this up to the operating system now, even more than before in previous OSX versions. When logging out of your account, you will now see this window. On next login you can choose to have your apps re-opened to their last state. A lot of this functionality is made possible by the new Document Model, so that apps like Pages can re-open all your open documents. Users of the inbuilt OSX Mail app will notice a change to make it more like iPad mail. As for the Launchpad, this helps Apple with "pull through" Mac sales from iPad users. The ability to pop up a familiar iPad-style home screen is cute but useless. I rarely need to see all the apps on my Mac, so I still use Overflow to store links to those apps that don't fit on the dock, but I still use from time to time. When trying to understand why Apple does things, you have to remember that Apple is a hardware company. It couldn't be more different to Microsoft, Google, Facebook, etc. Apple sells more iPads than iMacs. This will only increase over the coming years so Apple will push to convert iPad Windows users into iPad Mac users. The Launchpad is a tool to help with this. It's a marketing gimmick that you, the Mac user, can safely ignore! iCloud promises to be the biggest improvement to the whole Apple experience since the launch of the iPad. Today, document management across iOS and Mac environments is a joke. Sending files back and forth to yourself in order to keep them up to date is something out of the nineties. There are a number of clunky workaround solutions available but you can get that Apple will get this right when iCloud is released. iCloud should make all your important documents keep up to date by 'magic' across your Mac and iOS devices. ICloud is included in Lion, but it's not working just yet. Apple have already released developer updates to Lion containing improved iCloud builds. Once iCloud is working under Lion you will be able to share documents across OSX computers. We will have to wait for iOS 5 to see the real benefits of iCloud. As we've reviewed before, the App Store is a huge step forward for buying Mac apps. For the user, it is super-easy to buy reliable, tested software. 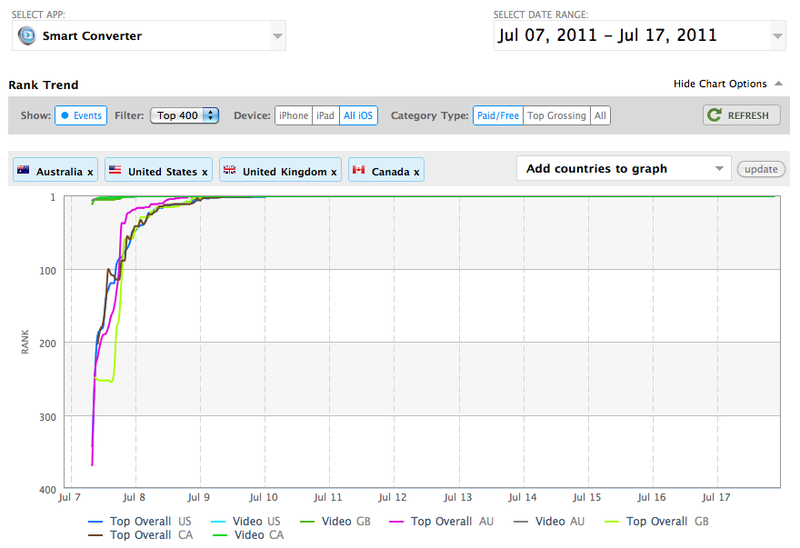 For us Developers, its an easy way to get good apps out in front of millions of new customers. The Mac App Store came out in January 2011 but was only available to users who updated to the latest OSX Snow Leopard patch. Since most people don't seem to do this, Lion is the first time that we will see widespread rollout of the Mac App Store. Out of everything listed above, the only thing in Lion that will affect you short term is the new Document model. This will only impact you if you use the iLife products as Microsoft may not jump onto this. If you didn't upgrade to get the Mac App Store in January, Lion will give you the Mac App Store for the first time. As with most operating system updates, the update itself does very little for you straight away. It's the apps and updates that come in the next year that will make upgrading worthwhile. My advice for Lion upgrades - do the upgrade, switch the trackpad back to normal and forget about it. iCloud and iOS 5 are the things to look out for later this year. We've tested the Shedworx apps against the released version of OSX Lion. Here are the results. Fixes are in the works for Comos and mkvWatch. We have also listed all the Shedworx apps on Roaring Apps, a good source of OSX Lion app compatibility. Supported on OSX 10.7 Lion, however some problems are present. Not supported under OSX 10.7 Lion. mkvWatch relies on WebKit version 1. OSX Lion includes WebKit version 2 only. mkvWatch will crash under OSX Lion right now. At Shedworx we first jumped into the 3D video scene in late 2010 with the purchase of the Panasonic "World's First" 3D camcorder and matching 3D TV. We did a camera review and were very impressed by the 3D experience. Since then, a lot has happened in the 3D camcorder space, so it's time for an update. Panasonic was first to the 3D camcorder game in October 2010 and have now made 3D an option for all of it's high end consumer video cameras. Panasonic have split their HD camera range into two segments - the single sensor budget line and the 3 sensor high end range. This is a move to provide consumers with two price points, and is probably a preparation step to drop SD cameras completely in the near future. 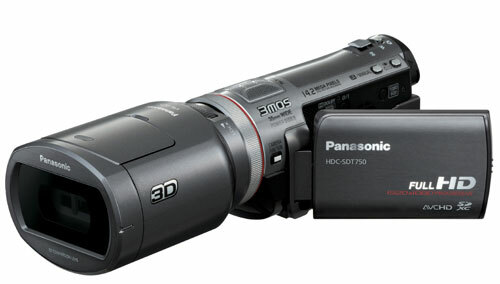 The Panasonic 3MOS (3 sensor) cameras now all have the ability to bolt on an optional 3D lens to go to 3D shooting mode. Panasonic 3D shooting uses a single sensor and a single video stream, recording the left and right eye video streams side by side, in AVCHD format. You can have a look at one of our samples here if you like. In 3D mode, the Panasonic has no zoom and no manual shooting controls. This means that you have to keep your subject between 1 to 3 metres (3 to 10 feet) away from you. 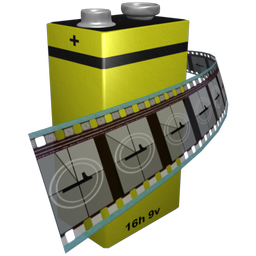 3D Panasonic footage editing on the Mac is only possible using our RevolverHD app, since Panasonic don't support Macs. All of the Japanese camera makers seem very reluctant to support the Mac even though some figures we see claim that Mac users make up over 50% of the high-end home computer market - exactly the people who will buy a 3D camcorder! 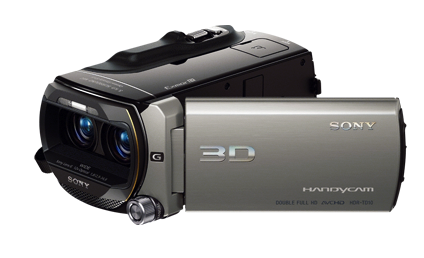 Sony was second to the consumer 3D game with its HDR-TD10 3D camcorder, announced at CES 2011. Sony has gone down a different path to Panasonic by creating a dedicated 3D camera with two lenses and two sensors. This lets Sony create a true 3D video containing a video stream for each eye, rather than recording side by side on the one video stream like Panasonic. Sony calls it's approach "Double Full HD" which is a good description. I haven't seen the Sony footage on a 3D TV so it's hard to say whether this will actually make a difference to playback quality. The other interesting thing on the Sony is its 3D LCD screen for playback. This provides 3D playback without 3D glasses, which sounds great, but is apparently not that usable. We have it on good authority that while the 3D LCD does work quite well, the real-world situation of looking at a 3D LCD then focusing on the outside world again is quite difficult. The Sony has almost no manual shooting controls once in 3D mode, but does have 10x optical zoom. While this is a good selling point over the Panasonic, when you zoom in 3D mode you will lose a lot of your 3D effect because the camera lenses are so close together. The Sony TD10 uses the new AVCHD 3D format, unlike the Panasonic which uses side-by-side recording onto a regular AVCHD video. A good early review of the new Sony 3D camcorder can be found here. JVC also announced its 3D camcorder, the GS-TD1, at CES 2011 and started shipping in March 2011. Like Sony, JVC has gone with a dedicated 3D camera with twin lenses and twin sensors. 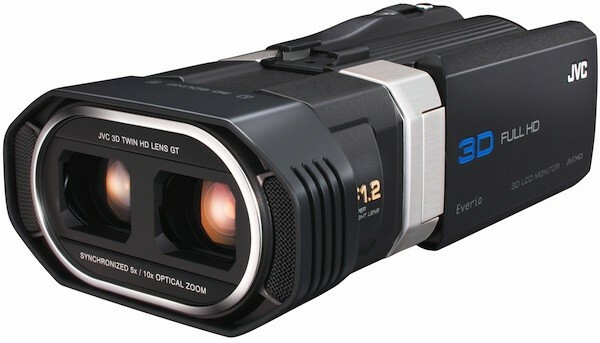 Like Sony, the JVC also has optical zoom in 3D mode, although only 5x compared to 10x on the Sony. This is probably more practical since the 3D effect drops off as you move away from the camera. Unlike the Panansonic or Sony, the JVC has some manual controls available in 3D mode. On the JVC you can control the all-important aperture and shutter speed settings, allowing you to get creative with your shooting effects. Like the Sony TD10, the JVC shoots in AVCHD 3D mode. A super-detailed review of the JVC TD1 by CamcorderInfo can be found here. The Shedworx Video Survey that we ran in April 2011 asked Shedworx customers what they thought about 3D for consumer camcorders. Over 60% of our customers plan to get into 3D in the next two years. Shedworx customers are on the 'prosumer' end of the consumer scale, but we were surprised to see how many people planned to get into 3D in the near future - its a lot more than we expected. Its fair to say that 3D is here to stay. 3D has had some false starts (does anyone remember Jaws 3D!) but this time around it seems like its going to work. Smart Converter - Still Number One! Its been one week since Smart Converter became the number one free app world-wide on the Mac App Store, and one week on, we're still there! Our daily downloads are off about 30% from our peak, but they're still looking strong and we should be able to hold on to number one for a little while longer. There are a lot of ratings on the App Store - averaging 3.5 stars with by far the most ratings being 5 stars. Smart Converter clearly works great for many users, but there are some conversion problems for some people too. Most of the negative comments are for when Smart Converter doesn't work for a certain video type. This is to be expected as there is an almost infinite number of video formats and variations out there, so no single conversion app will work all the time. What about Smart Converter Pro? We are beta testing Smart Converter Pro right now! While it would have been nice (and maybe smart) to have Smart Converter Pro ready before we released the base version of Smart Converter, it won't be far away. Smart Converter Pro includes all the conversion smarts from Smart Converter along with the new interface we have developed for all our converter apps. You will see the same user interface in our upcoming ReWrap app to take AVCHD files into Final Cut Pro X for Native AVCHD editing. Smart Converter Pro includes batch conversion, some Preference settings and no ads. Depending on how well Smart Converter Pro goes, we may also add extras such as trimming and playback into the app. Thanks again to everyone who has installed Smart Converter so far! If you haven't, grab it now. At Shedworx we deal with video formats every day and sometimes forget that you, our customers, usually don't. In this article we will cover the ins and outs of video formats, for the layman. We concentrate on video files that are created by camcorders. First of all we need to cover two important terms - Codecs and Bit Rates. The word codec is shorthand for the term coder/decoder. A codec is the file format and compression technique used to turn a real-world video or audio signal into a digital file or stream of data. A codec relates only to the actual video and audio streams within a video file. MPEG2 - the format used in DVDs. Note that MPEG2 is both a video codec and a container format. More on that later. You can use the Worldwide Number 1 FREE App on the Mac App Store, the Shedworx Smart Converter to get a detailed look into the video and audio codecs of your video file. You can also look into the video and audio codecs in a video file by opening the video in QuickTime and pressing Command-i. When we talk about video most people understand that the quality of the video has a lot to do with the resolution of the video. Full HD is 1920x1080 pixels, HD is 1280x720 and Standard Definition is 720x480 (NTSC) and 720x576 (PAL). The other big contributor to video quality is the bit rate. The bit rate is the number of bits per second required to make the video play. A bit is 0 or 1 - the smallest part of a digital file or signal. Video bit rates are measured in millions of bits per second - megabits (Mbps). The higher the bit rate, the more 'quality' you are getting in your video. For example, a 5 Mbps video contains one quarter of the quality of a 20 Mbps video. You can have Full HD videos recorded at low bit rates, so they look very shabby. YouTube, for example, supports 1080p video now but at a very low bit rate - 5 Mbps. YouTube's 1080p video format is a gimmick. Rather than 1080p video at 5 Mbps they should stick to 720p video at the same bit rate for a better quality video. Low bit rate videos become obvious when there is a lot of motion in the video. When this happens you will see lots of 'artifacts' in the video - little boxes everywhere instead of a good picture. The video will also look choppy and jumpy as it struggles to draw each frame without enough information for a good picture. The main point here is that bit rate is as important as resolution when it comes to quality. High definition video is of no value without a high bit rate to support it. What's in a Video File? one or more Audio Streams. The Video Container (also called the wrapper) is the file format that encloses the header, video stream and audio stream. The job of the Container is to wrap up the video and audio streams and provide synchronisation and streaming support. 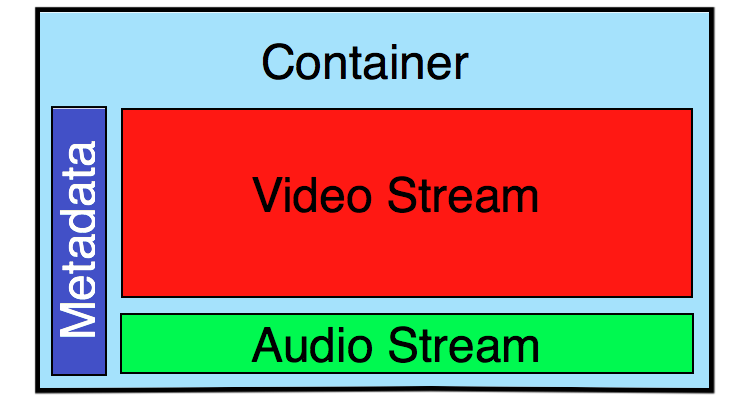 A Video Container usually contains one video stream and one audio stream, however multiple streams can be included. For example, 3D video can contain two separate video streams - one for each eye. Have you ever wondered how an iTunes movie download can play on your AppleTV, iPhone and iPod? This is because the QuickTime movie contains multiple video streams at different resolutions for the different devices. AVCHD - AVCHD has become the industry standard for high-end consumer camcorders. AVCHD supports H.264 video and LPCM or AC3 audio. MPEG4 - similar to MPEG2, MPEG4 is both a container format and video codec, so the name MPEG4 can mean both things. MPEG4 is an update to the older MPEG2 standard. The video codec part of the MPEG4 standard contains 28 variants. MPEG4 video Part 10 is identical to H.264. They are the same codec standard. Apple QuickTime - This is a general purpose container based on the MPEG4 standard. 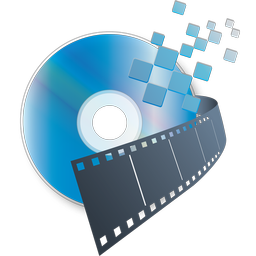 A QuickTime movie can contain a very wide range of video and audio codecs, making the QuickTime movie format extremely broad. Just because a video is in a QuickTime format doesn't mean it will play on all Apple devices. Each device (iPhone, iPad, AppleTV, etc) will have its own subset of QuickTime-supported codecs that it can play. A Container also contains information (or Metadata) about the video file contents. This Metadata can be the date the video was shot, resolution and even details on the video and audio codecs inside the file. When you load up an AVCHD video into a Shedworx AVCHD product (Cosmos, VoltaicHD, RevolverHD or HD QuickLook) the information that we display comes from the Metadata of the AVCHD file. The Video Stream is the picture part of the video file and contains a stream of a particular codec. A camcorder video file will usually only contain one Video Stream, but different video files can contain many streams. Different containers also support different video codecs. For example, AVCHD only allows H.264 video, whereas QuickTime allows a vast array of different codecs. The Audio Stream is the audio part of the video file. Just like the Video Stream, the Audio Stream will be encoded using a particular audio codec. A camcorder video file will usually contain one Audio Stream only. Commercial videos can contain many audio streams, for example, a stream for each language the film has been translated into. When you watch or edit a video, you are seeing all parts of the video file working together. Your device firstly had to understand the Container, then extract out the Video and Audio Streams, then start playing them in sync with each other. We take the playback of a video for granted these days but there are a lot of things that can go wrong with this. I hope this article has shed some light on the basics of video files, containers, codecs and streams. Feel free to ask questions in the comments!